An additional, unexpected, and quite wonderful followup to my MLB.com Shop ordeal after I thought things had ended. It turns out that not all is hopeless and the public-relations arm of MLB is both helpful and competent. I’m writing to apologize on behalf of MLB.com Shop for the dreadful service you experienced this past month when attempting to purchase a Giants jersey. Your experience was certainly outside of the norm and is inexcusable. We truly regret that we were unable to provide you with the level of service we consistently strive to provide each and every one of our customers. We would like to take this opportunity to offer you another replica jersey of your choosing or, since it seems you were finally able to find a jersey at a Giants team store, perhaps a t-shirt and cap of your choice. Please let me know which option you might prefer and which items we can send out to you, free of charge. Our apologies, again, for your poor experience. We can only hope to be able to have you back as a customer in the future to replace the negative impression with a more positive one. I decide to be honest. While the experience has left me a bit gun shy, as someone who definitely prefers shopping over the internet and dealing directly with the source rather than going through resellers, I appreciate your generous offer; it helps assuage my concerns with buying official MLB merchandise in the future. I’m currently pretty well set when it comes to Giants apparel. I do not need a third Giants jersey and I’m trying to abstain from any additional tshirts. My wife, however, would be ecstatic with her own replica jersey. We didn’t order one for her originally because there are no non-personalized women’s jerseys available with the World Series patch. We were trying to decide between item 3180911 (basic replica) and item 10887905 (personalized with patch) and couldn’t justify spending $30 just for the patch (she didn’t want a name and number). Since there was no urgency for getting a non-World Series jersey, we decided to just get my order and wait on hers. A small women’s replica jersey (item 3180911) would be great. Getting the World Series patch on there so she can join me in commemorating the occasion would be a wonderful late Christmas present for her. It feels weird to ask for something that isn’t available on the site. At the same time, I really don’t need any new Giants apparel and any upcoming purchases I will be considering will indeed be for the other members of my family. 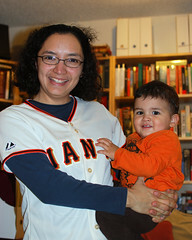 Also, that there was no World Series replica jersey for women was both surprising and disappointing to my wife. While I have no idea if my request is possible, I feel that the feedback is good. And yeah, worst case scenario (and, I’m thinking, most-likely) appears to be that she gets her own replica jersey without a patch. Ok we had Majestic make the women’s Giants jersey with a WS patch (which will be unique) especially for your wife. This was sent out this morning. The tracking number is ****************. Hope that the jersey makes it to you safely and that your wife enjoys it. And again, thanks for bringing your experience to our attention. We have learned some valuable lessons and are working on correcting things as we speak. Holy wow! More that I expected and it also seems like they really mean to see what the hell happened with my original order. Wow! I’m impressed. On a number of counts. I appreciate your going the extra mile on the generous offer. And it speaks very well of MLB that you take complaints this seriously. My wife is eagerly awaiting the arrival of her jersey and I hope to be able to complete the epilogue to my blog post with a photo of her in it. Tough email to write. Always strange to deal with shifting opinions. In this case, while my opinion of MLB.com shop has gradually moved from “you guys are incompetent” to “standard corporate screwup; standard corporate response” to, finally, “they actually seem to care,” my brain is still hedging and suggesting that I shouldn’t make any conclusions until we see what arrives. My brain is very pleased to see that UPS reports something to be arriving at the end of this week though. Look who’s happy about her late Christmas present! So yes. Maybe this is the reason to have a blog. In the past, an experience like this would result in my writing MLB.com shop to complain and then, if I were lucky, I would receive the bed bug letter. Of course, I would still be telling my friends about my experience and they would possibly be mentioning it to their friends as well. The end result would be. A handful of people who distrust, avoid, or recommend against using the merchant. Continued dismissive merchant behavior to the customers. No real possible way to change people’s attitudes. Now, while I don’t presume to have produced any changes in how MLB.com shop works, their hands are sort of forced by how easy it is for me to publish my experiences—producing at least some material evidence that “mistakes were made.” That free jersey is on someone’s balance sheet even if it’s just part of what’s been budgeted for such affairs. And with all the corporate belt tightening, every penny matters and of course they would like to avoid cases like mine. Meanwhile, I can honestly say that I would purchase from MLB.com shop again. Will I take a deep breath before clicking the “submit order”? Absolutely. But I’ll do so knowing that there are responsive people over there and that there is a commitment to keeping customers happy and to improving service should something happen. The post-screw-up situation now is much much better than it would be in a pre-blog world. And I think all parties would agree on that. This entry was posted in baseball, Giants, rants, sports. Bookmark the permalink.